to face Port workers who were on strike – a strike which has been joined by about 85% of all port workers – for the application of the current legal Status for the Free Port of Trieste (which should be administered according to Annex VIII to the Treaty of Peace with Italy – but is currently not), the Italian government, after acting completely outside any International law regarding the Free Port of Trieste’s administration for decades, had only one answer to the workers on strike. Let’s sum up: workers demand the application of current laws, fully in force. The Italian government does not reply to that request. 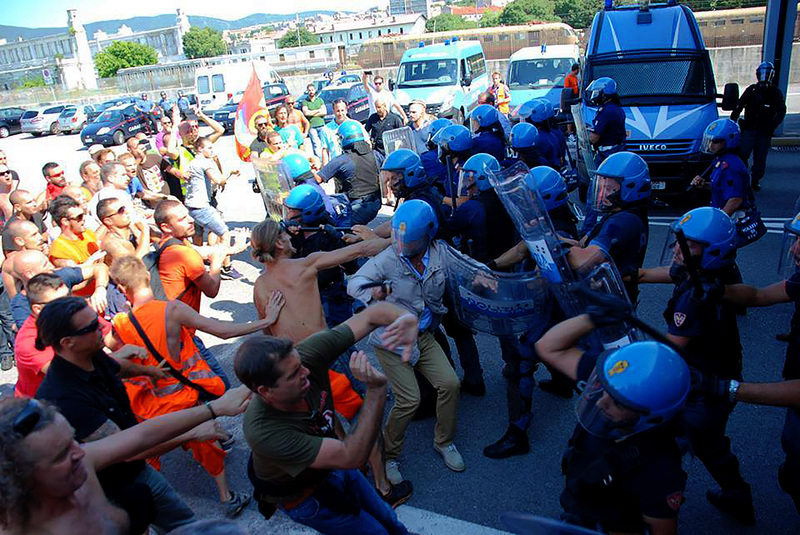 The Italian government instead sends police from outside Trieste for repression. It is now clear to everyone: Italy has no intention to comply to International laws on the Free Port of Trieste, and it is therefore needed for the International community to URGENTLY act upon the current situation, before it escalates even further. TRIEST NGO expects to intervene in the next few months in Geneva, in order to explain the current serious and illegal situation to a number of UN committees, as well as to start an inquiry procedure against Italy. Italy signed the 1947 Treaty of Peace and 1954 London Memorandum, agreeing to precise obligations towards the citizens of Trieste, and towards the administration of the Free Port of Trieste. These laws — namely, Annex VIII to the Treaty of Peace — are today fully in force, as confirmed by the Italian judiciary system and by the US State Department, among others. Yet, the Italian government has not been applying such laws for decades, and more and more citizens of the Territory of Trieste can not possibly stand the current state of things. The city of Trieste lost almost one third of its population, in the last few decades, thanks to the lack of development of (and subsequent lack of employment from) its Free Port.